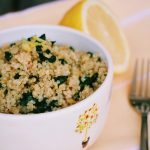 Garlicky, lemony and delicious this Garlicky Quinoa and Spinach Brunch Bowl is a super quick and easy, yet full of flavor side dish or brunch. It is a great little recipe to have in your repertoire when the day gets busy but you still need to eat. This page may contain affiliate links. Whole Food Bellies may receive a small amount of compensation for goods purchased through these links, at no extra cost to you. For full disclosure policy, please see privacy page. For those of you who don’t know; we moved this weekend! It was a bit of a process, but we made it, and we are now all settled in our beautiful new home. It’s so lovely! Now, I thought I was well prepared for the big weekend, as I had made lots of snacks for the kidlets (like these Blueberry Crumble Bites), and I had packed all the necessary cooking utensils in an easy to access box. The best laid plans huh….I forgot my kids have bottomless pits as tummies, and that moving is hungry work for mum and dad too. So the snacks didn’t last long. I also forgot to tell my husband that the box needed to be accessible…so it was only found and unpacked last night. Now we are (somewhat) unpacked, I have gotten back into the swing of things, and our fridge is full of real food again. Yay! I find it so hard to make good choices if I haven’t prepped for the week, so it was all falling apart for a while there. 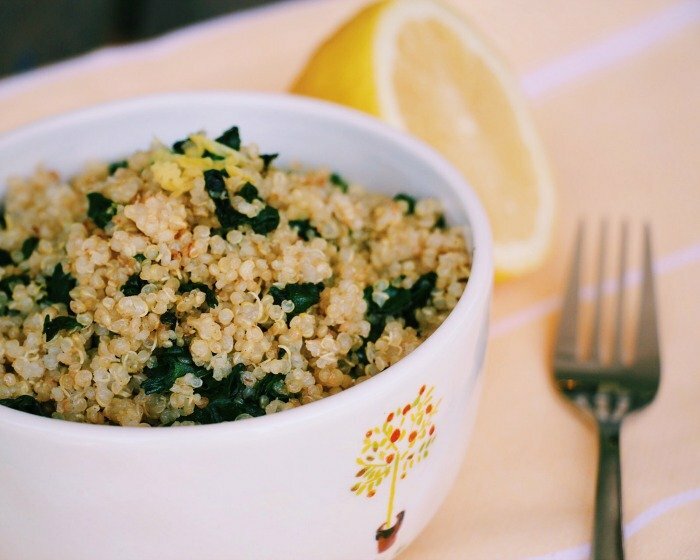 This Garlicky Quinoa and Spinach Bowl is delicious. I have had it for second breakfast brunch twice this week already, and my husband requested a double batch, so he could take some to work again today. My husband requesting spinach…unheard of! It takes a maximum of 10 minutes to prepare (if you have pre-cooked your quinoa of course), and it really packs a punch in the flavour department. Garlicky quinoa and spinach is the perfect dish to serve up for brunch, as it looks quite fancy and cafe-ish with a perfectly poached or fried egg on top, but is a cinch to prepare. 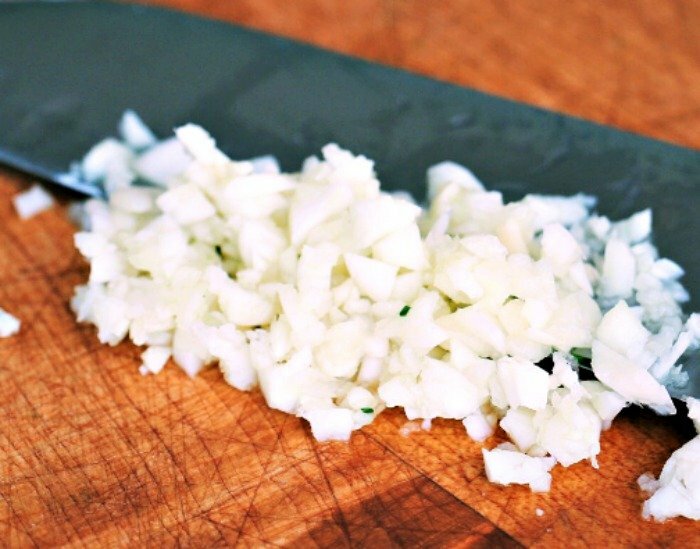 I do make it quite heavy on the garlic, so adjust up or down depending on your preferences. Hubby has suggested it would be perfect with a nice piece of fish nestled on top. I wholeheartedly agree, and will be trying that out this week 🙂 How would you eat it? 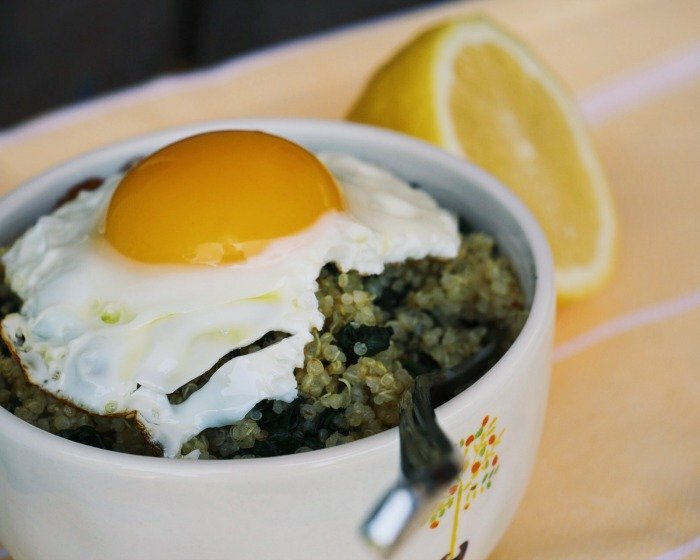 I would love to hear what you think about this Garlicky Quinoa and Spinach Brunch Bowl! Leave a comment, like on Facebook, pin to Pinterest or tweet on Twitter. 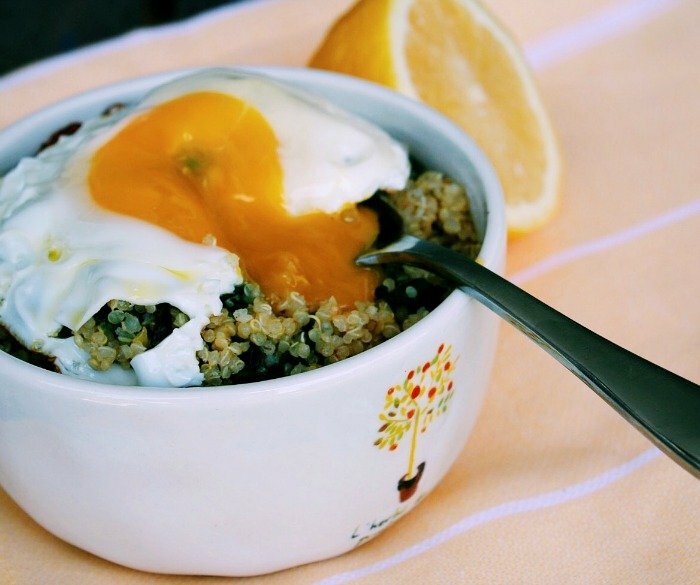 Fragrant garlicky quinoa with wilted spinach and lemon zest - fantastic for brunch, with a perfectly poached or fried egg on top. Or make it for dinner and serve with a nice piece of fish. By the way, if you want to cook your quinoa in 8 minutes I would totally recommend investing in an Instant Pot. I recently picked one up, and it has made weeknight cooking so much quicker (I have no affiliation with Instant Pot, I just really like mine). This looks amazing… I gotta try!!! Very welcome 🙂 Hope you enjoy!! I love that it has so much garlic! It looks really delicious with the egg! Love this, I’m so obsessed with quinoa at the moment, bet it’s delicious with spinach and garlic! First of all, Congrats on your new home! I must admit I never tried quinoa before…but this looks really yummy! I’m going to try this.. 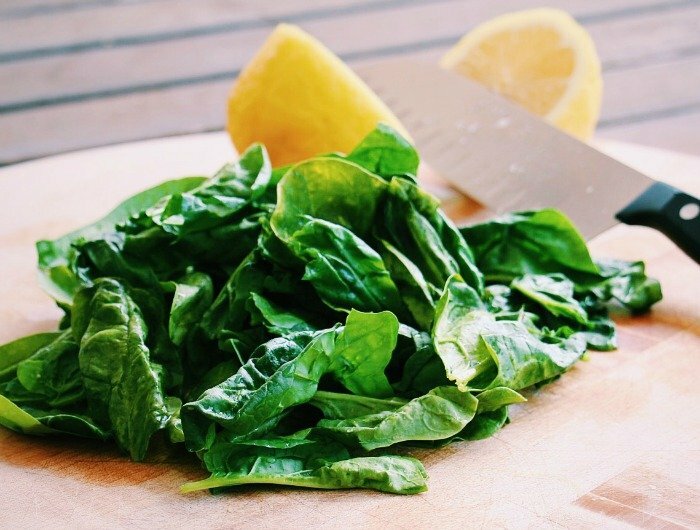 I love spinach and garlic so this can’t go wrong…Egg or fish: I love both. I haven’t decided yet which one I’m going to choose . I’m definitely going to enjoy this 🙂 Thanks! Thank you, so nice to be settled in a new house with a bit of space for the kids to run around!! Good luck venturing into the world of Quinoa 🙂 I’m a bit obsessed with everything quinoa at the moment because it’s so versatile! I hope you enjoy Nina, the egg tastes great in there! This looks amazing! Quinoa is my new obsession! You had me at garlic. I love how simple this recipe is! Thanks for the heads up Richa!! I did have one but it seems to have disappeared 🙂 That’s this afternoons project sorted! I need this in my life like NOW. This looks so yummy and perfect for a meatless monday meal. Saving and making for sure. I hope you do Amy! Ummm yes, with the eggs, omg yes! This sounds super simple and looks so good! I love anything garlicky so this is right up my alley! I love the addition of the egg on top too for a texture/flavor change. It looks delicious.